A soft mesh and some synthetic materials make a comfortable and breathable upper unit based on the remarks of several runners. Most reviewers appreciated the attachment tabs on the upper for gaiters, which offer more protection against dirt and other debris. Runners generally welcomed the anti-microbial treatment given to the Ultra 290 because it keeps the interior environment healthy. The Meta-Shank Generation III delivers flexibility and impact protection for the forefoot area. Sticky rubber in the outsole area ensures durable protection and traction that’s needed for racing, according to a few testers. Some runners felt that the Race Ultra 290 was a bit narrow in the forefoot area. Others weren’t impressed by the midsole, which to them was mostly stiff in the midfoot and heel areas. It has an expensive price. A few thought that it was a bit too heavy for their feet. Although the Inov-8 Race Ultra 290 was successful in delivering a comfortable and breathable ride, it still received negative feedback from users. Some runners thought it was too narrow, heavy and expensive. Despite the negative comments, some runners still consider the shoe as a great addition to their collection. The Race Ultra 290 offers moderate stability, durable components and responsive performance for everyday training. I had few Inov-8 trail shoes before these. All of them had fit my wide feet really well (Inov-8 standard fit, not precision fit). But for my 90 kg build their soles were usually too thin and I felt the rocks and roots so much that it was difficult to do more than 10-15km on trails. After reading the description of Race Ultra 290, they sounded like just the thing I need. They are supposedly made for long distance and mixed surfaces. I liked the idea because one of the things I often do is run to the nearest trail instead of driving there. That way I have 6-12km of asphalt on the route. So sensitive soles like Salomon Speedcross would not be good for that kind of running. The 290's after the first run. These shoes are not exactly fancy and good looking. They are not ugly, just plain looking. Inov-8 has two types of shoe fits, one is "precision fit" which is narrower and other is "standard" which has more toe room. Inov-8 standard fit suits my wider feet perfectly, it was the same with 290's. The feeling when wearing them reminds me of the Adidas Supernova Boost, so that means they are very comfortable indeed. Sole is thick enough, rocks and roots are usually not felt. At the same time, it is still flexible enough that you can feel the surface under. If you have very narrow feet, perhaps this is not a model for you. In case of wider feet, go for it! There is a lot of room in the toe box. I found the sizing to be realistic, size UK 11 fits me perfect as all Inov-8 shoes with a normal fit. For an Inov-8 precision fit I must go a half size up. Kudos to Inov-8 for keeping the sizing consistent on various models. For comparison - I have to wear UK 11.5 Hoka or Salomon. Looking at the grip it does not look too special, but in practice, it holds really well in all conditions except deep mud. And unlike most of the trail shoes, it is really comfortable on the pavement too, also without being too loud like some trail shoes. The sole composition is such that it is relatively good even on wet surfaces. The durability of the sole is high. After almost 300 km of mixed surfaces (at least 100 km of asphalt) the sole is pretty much as new. As for the upper - so far so good. Nothing is torn, there are just normal signs of wear. Upper is breathable enough, I had no problems during the summer. Also, it drains the water good, so no problems with the rain and water. This is how they look like after 300 km with some rocky and hard trails, also quite a lot of asphalt. They have been machine washed at least 3-4 times. You can see that the sole is still pretty much like new and upper has no tears. I am quite sure they can handle 600-800 km without problems, perhaps even 1000+. I went up to 30 km trail runs with them and had no sore feet or blisters. They should be a good solution for longer runs and races, especially in the mixed terrain races which include some asphalt. Also, they are an excellent solution as door to trail shoes when you run several kilometers on the pavement in order to reach the trail. Grip perhaps is not perfect for very wet and muddy conditions, but it works good enough even then. We once had trail race on a pouring rain which included A LOT of mud. On some parts, the mud was up to mid-calf but I managed to finish without falling or slipping. Yes, I was more careful with them on the feet but they had performed unexpectedly well. Here is a photo after the race and after some washing of the legs and feet. The other race was on the seaside, again with the rain. AGAIN I took the wrong shoes by mistake. Some people never learn:). This race had included muddy parts like running in wet sand, running on wet stones and even running through sea higher than knee level (on some parts). I was worried that my shoes will fail me during the race. That I will fall and injure myself, but that did not happen. It was slightly more difficult to run than it would be in more suitable shoes, but I managed just fine. Here you can see how the terrain looked like in some parts. Now imagine the stones wet after the rain! The only negative I can find is the relatively soft toe box. So if you are on the steep downhill you could experience some touching of the toes and front of the shoe. Nothing disturbing and I did not lose any toenails. Sometimes though it is slightly uncomfortable and it slows the downhill speed. Sizing is adequate, a larger number would definitely be too big for me. Also, soft toe box means less protection against the stones and roots. It is sufficient for most of the trails, but they would not be my first choice for the difficult terrain. If you are looking for one shoe for all situations then I think that Inov-8 Race Ultra 290 comes as close as possible. They are not perfect for any surface but they do a really good job on most of them. For me, the killers for most trail shoes were usually the asphalt parts of the route. Now I can be at peace because there will be no issues on asphalt. They perform almost the same on asphalt as standard road shoes. More importantly, if you are of heavier build with wider feet and are looking for shoes which will not kill your feet, these ones could work for you! With its grippy and stabilizing outsole lugs (made from three types of rubber) and protective features, this shoe seems most at home on semi-technical or really rocky terrain. I really can’t find any negatives about this shoe other than the obvious…. If it’s really muddy you won’t have enough grip but that isn’t a criticism of the shoe, it’s more about having the wrong shoe for the job. There was little chance that the Race Ultra 290 was going to disappoint and in fact it excelled across the board on test. The Inov-8 Race Ultra Race 290 features a durable and reliable outsole through the Tri-Endurance compound. It delivers reliable grip on tough terrain and durability on high wear areas. The shoe also comes with Meta-Shank III Trail-Roc shank that is designed to provide added underfoot protection and flexibility for a more comfortable, responsive ride. The Race Ultra 290 is in standard running shoe length. It provides great and comfortable fit, accommodating foot with normal measurements. 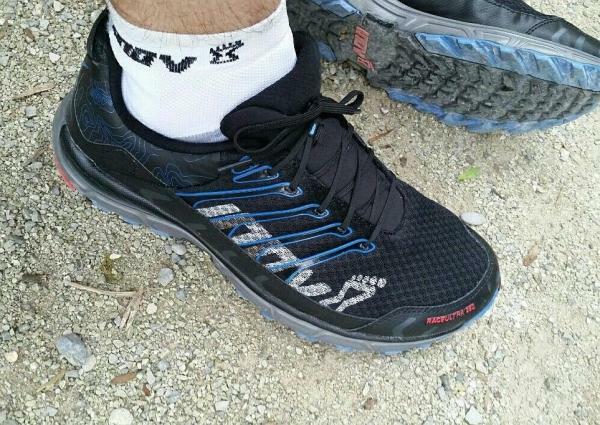 Invo-8 is offering this shoe in standard D and B widths for men’s and women’s version respectively. The outsole comes with a 4-mm deep outsole lugs that are designed to deliver reliable grip while running on the trail. It also features the Tri-Endurance compound that gives durability to the high-wear areas. In the middle section of the entire outsole features a black and medium density compound which also comes with uphill and downhill lugs. The outsole performance of this shoe is as durable and reliable as the Brooks Cascadia 13. The materials used in the outsole of this footwear are also used in other durable running shoes from Inov-8. A light polymer Meta-Shank along the midsole aligns with the bones of the foot, encouraging natural foot movement while protection runners on tough terrains. The midsole also has a single density injected EVA that delivers reliable cushioning. It comes with the Meta-Shank III Trail-Roc shank. This is known as a five-finger polymer that aligns with each metatarsal. This helps to retain underfoot impact protection and flexibility. The upper of the Race Ultra 290 features a soft mesh that mixes breathability with keeping the dirt out fairly well on dusty and dry trails. For enhanced protection from sideways incursions with rocks and brush, it also has the reinforced toe bumper that extends into a rand. It wraps entirely around the shoe, which can be very useful in many runs. It has two attachment points for the Inov-8 gaiter lie flush in the rand on the adjacent and medial aspects of the shoe which is convenient if the runner has the gaiter. A padded, not-so-thick tongue is gusseted three-quarters of the way back which keeps rock and dirt out without creating pressuring or discomfort.